Secondhand, quality manual telephoto lenses. As mentioned on several occasions, one cannot afford the luxury here in Orkney of long exposure photography, at times the most one can hope for is perhaps a break of half an hour or so, often less than that. Most telescopes offer focal/aperture ratios of f/6 or more. Where a focal length of 600mm or more is concerned dedicated telephoto lenses can often fill the bill and S/H manual lenses are often cheaper than a corresponding apochromatic triplet. For example, the 800mm f/5.6 Nikkor lens featured below is fast enough and “powerful!” enough to give good results for smaller comets, many galaxies etc. At £1500 this is less than half the cost of a William Optics 132mm f/7 apochromatic triplet. The small EQ3 mount is very portable and when set up correctly can give reliable guiding for exposures up to 50 seconds or thereabouts. Fitted vernier scale for fine focussing. We receive from time to time questions respecting the instruments used here on Rousay for the variety of subjects we study. Information for the AURORA may be found on “The Orcadian” site archives. For comets (depending up brightness and size of the comet) we may use a range of lenses, usually by Nikon ranging from fast, short focus Nikkor (e.g. 105mm f/1.8) to the relatively fast, long focal length telephoto lenses such as the 600mm f/4. Smaller, fainter comets and supernovae in galaxies we use either the achromatic 150mm aperture f/5 refractor or the 132mm f/7 apochormatic refractor. The former is fast but has poor colour correction, the latter is slower but gives superior image quality. The Ritchey Chretien reflector 200mm f/8 is reserved for smaller objects but is slower and requires steady atmospheric conditions for longer exposures, and due to its open tube cannot be used in strong winds. 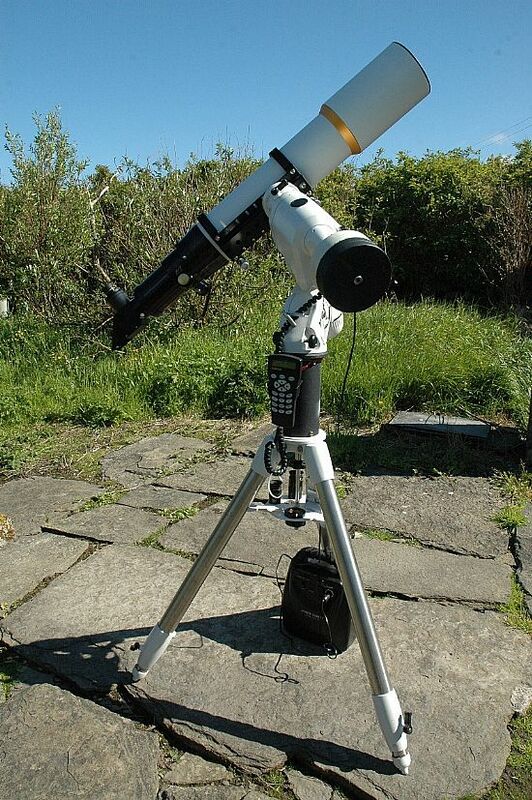 For exposures lasting over 120 seconds it is necessary to use a guide telescope fitted with illuminated graticule. Apochromatic 132mm f/7 refractor with shield to protect O.G. from direct sunlight. With this device it is possible, under favourable conditions, to observe Mercury from magnitude 1.4 to –2.3, even when within 1˚ of the Sun’s limb. Observations close to the Sun should only be attempted by experienced observers, and then only when the planet is east of the Sun in case of drive failure, thus bringing the Sun into the field with disastrous consequences for the observer’s safety. 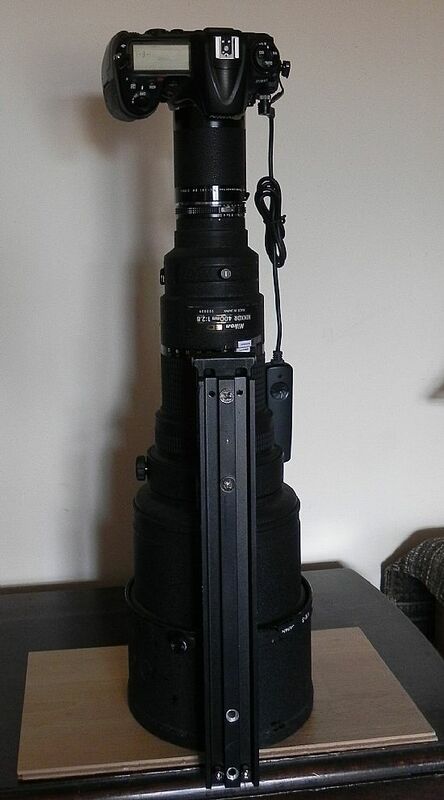 Nikkor 400mm f/2.8 with x2 converter giving a focal length of 800mm at f/5.6. Below: close-up to show vernier used for accurate focussing. Many, many years back now when I was on the staff of the London Planetarium (as it then was) one of the most frequently put questions by visitors was “what sort of telescope should I start with?” I used to surprise most folk by replying “no telescope at all!" Instead I would suggest that beginners equip themselves with a small pair of binoculars and a god star atlas. I have not altered my approach since then for despite the widening popularity of the subject of astronomy, and the vast range of instruments now available at reasonable prices, the only way to get know your way about the sky is to go out there on clear nights and look around. First get to understand the limitations of your most prized asset—the unaided eye. Then move on to a binocular, for at this stage to see with both eyes over a wide field is preferable to concentrating on a very small area of sky afforded by most cheap so-called “entry level” telescopes. (Initially many people are disappointed with the view through a telescope of the planets and nebulae simply through lack of basic observational experience.) The only celestial object seen to good effect through small telescopes (and a large binocular) is the Moon. I recall an observing session at the University of London’s Observatory, Mill Hill (even then the observatory dome was bathed in sodium road lighting). 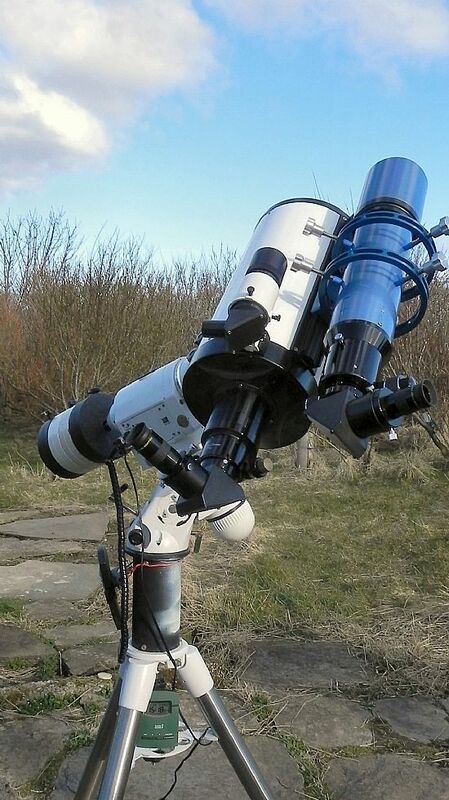 The telescope (a splendid Cooke 200mm aperture refractor and recently renovated to pristine condition) was used on open nights for visitors to the Observatory. Following a brief introduction I turned the telescope, equipped with a power of 350x, on planet Mars. The response was unanimously on the lines of “is that all?”! Of course in the pre-digital age one had to content themselves with visual images of the planets often achieved over long periods of discomfort at the telescope. For casual observing—nebulae, the brighter comets etc., or, as we have indicated simply to enjoy the vast array of stars out there, a good pair of binoculars will reward one well. The logical step to a telescope should be approached with some care since there is no single all-round instrument that will serve for all categories of objects open to the observer. The idea that the larger telescopic aperture the better does not necessarily hold. 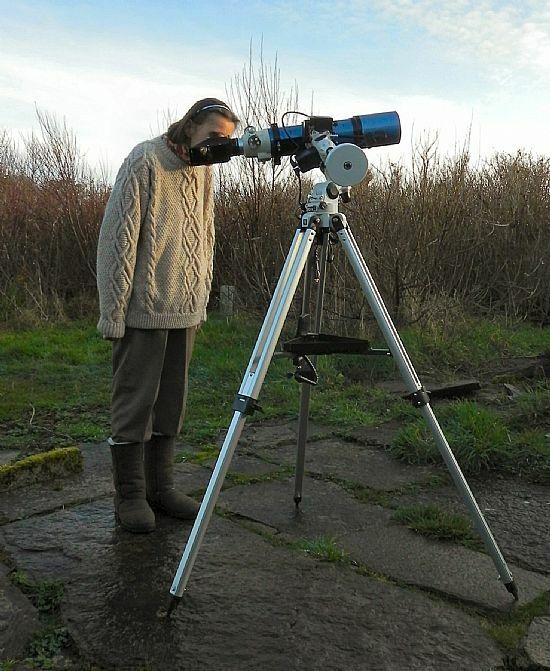 The best telescope in the world is only as good as its mounting and for this one should go for a sturdy equatorial of appropriate size having mind to portability. 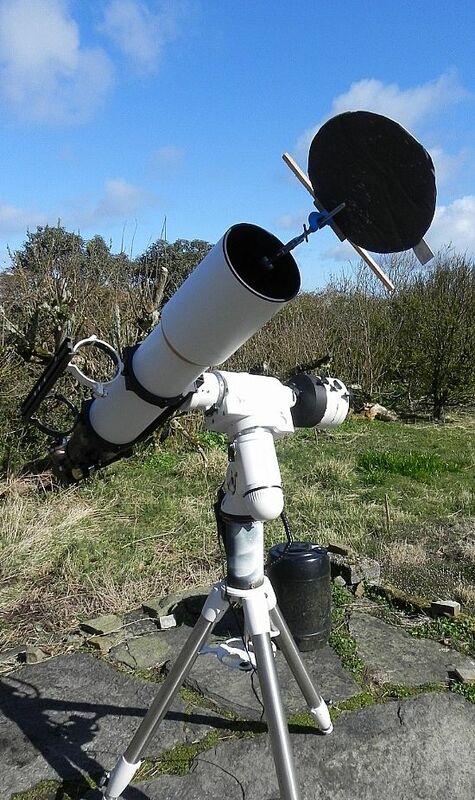 The set up just described would cost in the region of £300 for the telescope and about the same or a little more for the mounting. The same mounting, without the electrics and go-to, would be much cheaper (say £180 off) and would still provide a workable unit. Here in Orkney one has a continual battle against the elements. The sky is seldom clear from dusk to dawn, nor from dawn to dusk for that matter. Therefore it is important to have the equipment ready in order to take immediate advantage of a clear sky. (Our work on comets is frequently snatched between breaks in clouds of a few minutes on occasions.) Portability is of the essence, unless one is fortunate enough to have permanent housing for their equipment. Wind too (need we say!) is a major factor. The EQ3 mount mentioned in Part I is too light for a force 7 let alone anything higher than this. 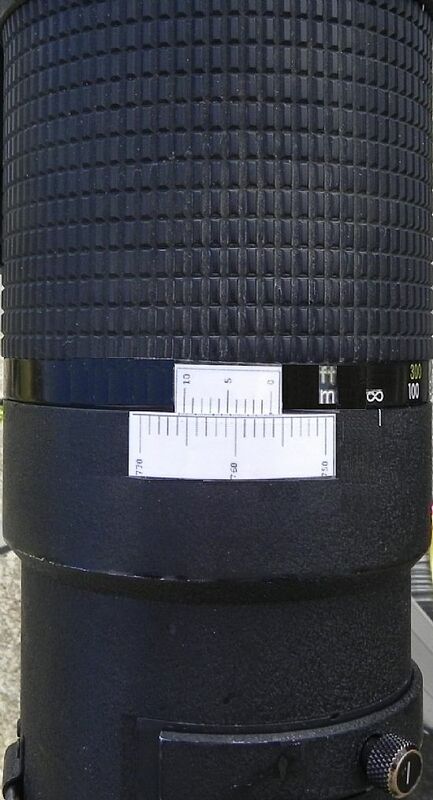 A more expensive and robust equatorial is necessary in order to counter vibration from wind. (See below.) 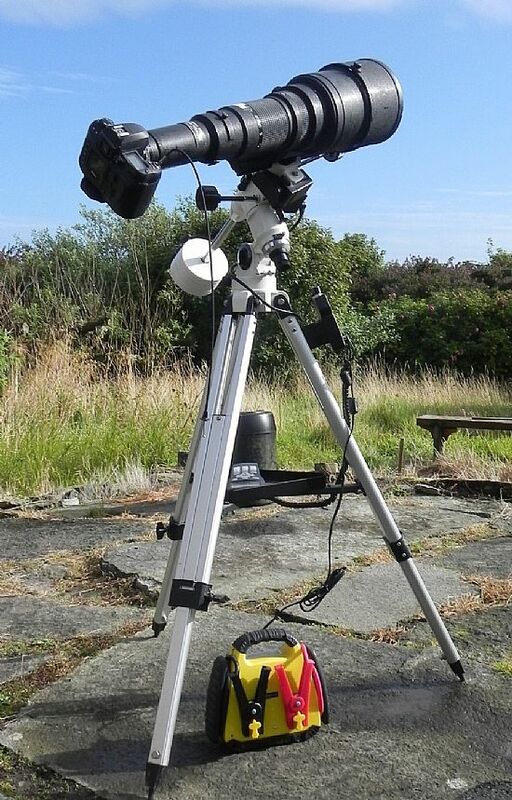 An EQ5 or EQ6 mounting may be put in place on a concrete or sandstone platform with small holes bored in the surface to locate accurately the tripod feet. Here in Rousay we assemble our heavy 132mm apochromatic refractor in three stages: first the mounting on its tripod stored under cover close by, followed by three 5 kilogram counterweights and finally the telescope itself. All this can be archived within three minutes by one person working on their own. The battery and electronic setting up using two stars may take another minute or so for which the services of a good quartz timepiece is useful. Of course visual observations at the telescope may be carried out in buffeting conditions provided one has both patience and time, but for imaging a firm mounting is essential. For those unable to use a dedicated CCD set up we have discussed elsewhere the opportunities for acquiring relatively inexpensive manual telephoto lenses. Added to this we have jetty lights that remain on through the night time so that taken all in all it is now virtually impossible to find a truly dark sky anywhere within the Orkney Islands. It will be seen from the image obtained by Michael Sinclair (Veil Nebula) that it is possible to counter some of the problems of light pollution but the seeding of high cirrus by aircraft is an insurmountable problem. Observations in daytime or in strong twilight. What can be observed in the natural sky during daylight? 3 The planets Mercury and Venus. Mercury may only be seen well above the horizon in full daylight and Venus, owing to the brilliance of its surface, is best observed against a bright sky. The planets Mars and Jupiter may sometimes be well seen through a telescope in daylight but Saturn, owing to its low albedo, is a tricky object by day. 5 The brighter stars. A star of magnitude 1.5 (depending upon colour, altitude and apparent separation from the Sun) may be seen in a 100mm refractor in a good quality sky. In my early professional days working on binary stars using large refractors (in excess of 250mm aperture) our programme includED many stars as faint as magnitude 7 that could be well seen in daylight or strong twilight when quite often good seeing prevailed. The techniques for locating objects in daylight have been made somewhat easier with the go-to system. However, this will still require the use of “alignment” stars. 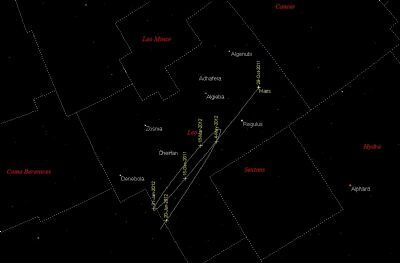 For this purpose under good conditions a 80mm refractor may reveal stars of 0.6 magnitude or brighter: here in the northern hemisphere the bright stars Arcturus, Vega and Capella are ideal since at least two are generally visible at any given time throughout the year. For those unable to locate the “alignment” stars in daylight, but who would stand a fair chance of seeing either Mercury or Venus owing to their much greater brilliance, there are other techniques involving the Sun that I shall not detail here. Anybody interested in having full details should contact the site direct through the Guest book page giving their contact details. From Planets to Galaxies – the relative scale of things. When I started to become seriously interested in astronomy in my very early teens (I had a smattering of interest long before then) I was fortunate in having the assistance of my father and paternal grandfather. Even so, I have to confess, I found it difficult locating many of the constellations that appeared to resemble little if at all the names given to them by ancient sky watchers. Then, one evening in early spring, I was grappling with the constellation Leo (which, I was informed bore some resemblance to a lion, in outline at least) when suddenly it all fell into place. Up to then I had been getting the scale of things too small: Leo is a large beast, the 12th largest constellation in the entire sky. Once I had grasped this salient fact, then the lesser constellations too soon became familiar and by the following winter I was able to find my way about the night sky with perfect ease. The question of the relative scale is important, not just with linear or angular size but also with time and the order of brightness. For example, the recent interest in the supernova in the galaxy M101 raises the two parameters of apparent size and brightness. Yes, M101 is quite large in the league of galaxies with an apparent overall diameter of around 28.5 arc-minutes, or a little under the apparent size of an average full moon. It’s surface brightness, however, is quite another matter with a full moon being some 1,000 million times brighter than the galaxy! This example of degree opens up another question that I have been asked over the years on the lines “How many stars are there in our own galaxy, or how many galaxies are there in the universe?” Such questions are impossible to answer precisely, if at all. Like most questions with a cosmological slant we run into difficulties because of the time dimension. (I spent a good deal of time in the late 60s lecturing on cosmology.) One can be precise about, say, the number of playing cards in a pack of cards or the number of chessmen in a chess set. This is because both are contained with in physical entities. But you do not have to venture outside our planet in order to comprehend the pitfalls when we attempt to quantify, say, the number of grains of sand on the beaches of the Island of Sanday. This is a good analogy with the cosmological question (seldom if ever asked by cosmologists incidentally!) namely “what IS the Universe?” The number of grains of sand on a beach anywhere will depend upon the state of the tide and the definition we have for the beach itself (its extent). Perhaps it would be more reasonable to ask how many grains of sand a bucket of known volume can accommodate. Let us assume we can find a solution to that one; but now what happens if instead of number (individual grains of sand) we talk in terms of mass: what is the mass of sand contained in the bucket? That could be measured and will be proportional to the number of grains. Now substitute water for the sand. It will be easier to weigh the bucket filled to the brim with water than it will be to determine the number of molecules of H2O in the bucket. But there now enters another factor in the form of time itself. This is because water evaporates and so in order to be scientific (precise) about our experiment we must state the exact time the water is weighed. It can now be appreciated how meaningless is the question “how many stars are there in our galaxy?” Disregarding the immense physical size of the galaxy, we have also to contend with the coming an going of stars within stellar populations. Carry the argument still further into the distribution and extent of galactic populations and we should soon come to realise that we may have to find a definition for universe that excludes a concept of an entity. This short extract highlights the dilemma we face in the study of cosmology. We extrapolate in both space and time observations at a localised level. This leads us into a universe as an entity in which time is ill defined and all too frequently assumed to have a linkage to matter that may be invalid. Thus, we have such statements as: Matter and time were created within the singularity of an event we refer to as the “big bang.” In my humble opinion the statement is a nonsense unless a continuum with the properties of time can be envisaged in order to provide the circumstances for the “big ban” to materialize. Essentially we have to emancipate our thinking from the drudgery of beginnings and endings. Fortunately, here in Sky Notes, we can give reasonably accurate information about events astronomical whilst we may safely leave the theoreticians to argue over the velocity of particles or the wrappings (baggage?) implicated in string theory! Jupiter has now passed opposition and will become a more familiar sight in our evening skies as the weeks pass. At the same time, as stated in the previous article (below), Jupiter will both decrease in apparent size in the telescope as well as in apparent brightness. Both Mercury and Venus are in low declination for the next two months and will not be readily visible from high northern latitudes. 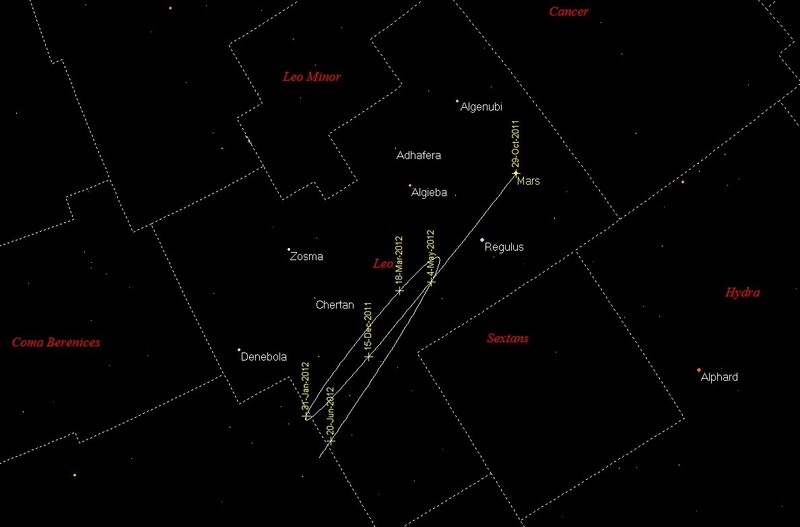 Mars, on the other hand, is brightening steadily and will move relatively slowly in forward motion (W to E) through the constellation Leo coming to opposition on March 3, 2012. (The location of Mars will be found henceforth on the “Sky View” page of this site.) The forward motion will slow towards the end of January 2012 with Mars reaching a “stationary” point on January 25 after which it will retrograde towards opposition. Currently at magnitude 1.1, Mars resembles both in appearance and brightness the star Aldebaran in the eye of Taurus the Bull. By the end of November the planet will have brightened noticeably. The fact that Mars will remain in the constellation Leo from the present up to the last week of June 2012 emphasis the size of this grouping (see dia.1). Dia. 1. The constellation Leo with all the principle stars named and showing the constellation boundaries. The track of Mars is shown from 29 October 2011 to 30 June 2012. NOTE: The appearance of the southern sky in late evening and early morning may be found on the SKY VIEW page. IMPORTANT LINK: Visit the NOTICE BOARD for the latest information and observations. JUPITER at Opposition October 29 2011. The coming Jupiter opposition will be one of the most favourable for northern observers, in many respects, within the planet’s sidereal period of 11.87 years. For those unacquainted with the terminology we should state that opposition refers to the position of a superior planet (a planet with an orbit outside that of the Earth’s orbit) in its orbit when it lies diametrically opposite the Sun as viewed from Earth. It follows that at opposition the planet will be at its closest to Earth for the period of one year and that it will appear due south at approximately true midnight. The sidereal period for a planet is the interval of time it takes for that planet to circuit the sky with reference to the stellar background. As viewed from Orkney the forthcoming opposition will see Jupiter reaching the meridian (due south) close to midnight (UT) and at an elevation of 42° 43'. It is true that in 2012, 2014 and 2015 the planet will have an even greater elevation at opposition, but in 2011 Jupiter is at its closest (3.9700 A.U) and brightest (visual magnitude –2.9). How do the distances affect the appearance of Jupiter from Earth? The decrease in apparent size of the planet may not appear significant but it is sufficient to cause the magnitude of Jupiter to drop to –2.6 by 2015, a considerable diminution in apparent brightness of around 75%. 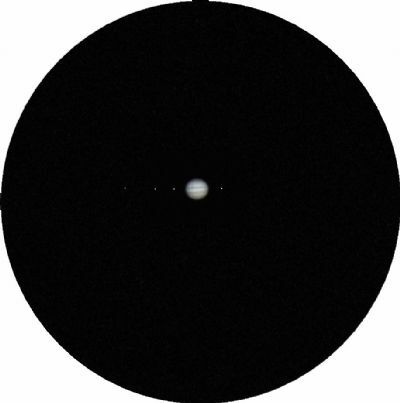 Jupiter appears relatively “large” even in small telescopes. For example, a 60mm refractor with a power 0f 60x will render an apparent diameter of approximately 50' very nearly twice the apparent diameter of an average full moon to the unaided eye. In many respects, therefore, Jupiter is the most rewarding planet to view through the telescope. Not only may we see detail on the disc itself (remember we are not seeing the solid surface of the planet but only its dense atmosphere, with its broad banding) but there are also the ever-changing aspects of the four, large Galilean satellites (including eclipses, disc and shadow transits). Jupiter in fact occults the 10.8 magnitude star TYC 638-424-1 during daylight hours on October 1st; by the time darkness arrives the star will be seen to the east between the planet’s disc and the satellite Ganymede. Also a little below Jupiter will be seen the much brighter 8 .1 magnitude star TYC 638-290-1. But one will have to wait until around 20h UT for the planet to be at a reasonable altitude above the eastern horizon. Not until November 10th will Jupiter appear close to another star brighter than 11th magnitude (TYC 633-550-1magnitude 10). On the other hand phenomenon involving the four major satellites occur quite regularly around the time of opposition, many of which may be observed without difficulty using telescopes of 60mm aperture or more. Of these eclipses of the satellites by Jupiter himself are more accessible than are transits since the latter require higher powers. My own early observing skills were honed timing such events using a stopwatch with reference to the “good old” GMT signals or “pips”! One thing (among many) that practical astronomy teaches one is patience and perseverance. Nothing worthwhile in life is achieved without dedication and, perhaps, a degree of fanaticism!